The smell of masticha and the saltiness of the sea, dominate the whole island. While the rich forests and long beaches of Chios fill the sight of travelers with colours, to spend their holidays in the Aegean-sea paradise. During your stay in Chios you will enjoy the warm hospitality of the inhabitants, you will try the local cuisine and products of the island. 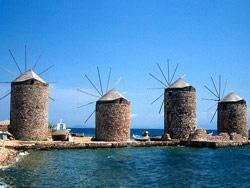 Chios is a destination that has everything: natural beauty, history, civilization and culture. Every visitor finds in the fragranced island the lost paradise of its childhood dreams.